^ a b Weston, Helen (1996). “A Look Back on Ingres”. Oxford Art Journal 19 (2): 114–116. doi:10.1093/oaj/19.2.114. ^ a b Kleiner, Fred; Christian J. Mamiya (2005). Gardner’s Art Through the Ages (12 ed.). California: Wadsworth/Thompson Learning. pp. 826–827. ISBN 0-534-64091-5. ^ Benjamin, Roger (December 2000). “Ingres Chez Les Fauves”. Art History 23 (5): 754–755. doi:10.1111/1467-8365.00242. ^ a b c d Maigne, Jean-Yves; Gilles Chatellier, Hélène Norlöff (July 2004). 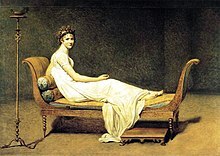 “Extra vertebrae in Ingres' La Grande Odalisque”. Journal of the Royal Society of Medicine 97 (7): 342–344. doi:10.1258/jrsm.97.7.342. PMC: 1079534. PMID 15229267. https://www.ncbi.nlm.nih.gov/pmc/articles/PMC1079534/ 2008年1月9日閲覧。.